Kenny Wells (Matthew McConaughey) is a prospector in Texas who is desperate for a big break and becomes convinced that he can strike gold in the jungles of Indonesia. So in 1988 he teams up with geologist Michael Acosta (Edgar Remírez) to help him excavate and get their commodity on the stock market. 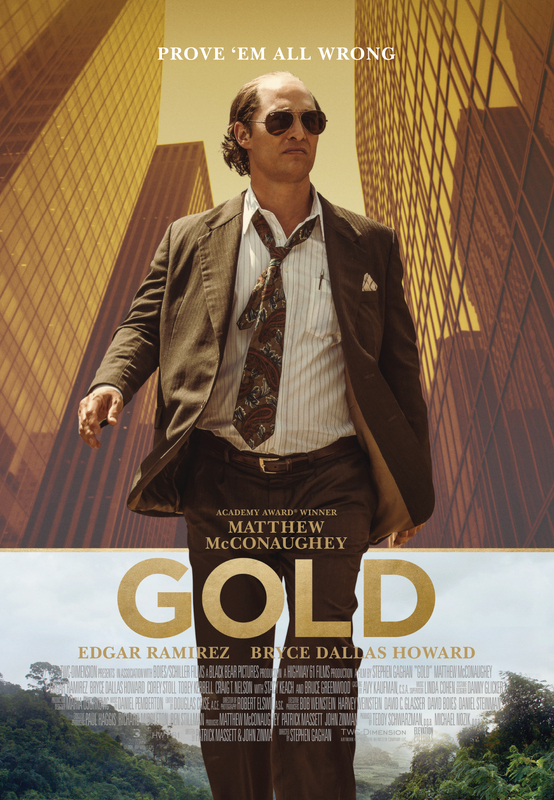 Loosely based on a true story, that took several stranger than fiction turns as the two men at the centre of it all starting getting richer by the day while companies were begging to get in on their scheme, Gold is one of those alright films that feels somewhat frustrating because it should have been better. Directed by Stephen Gaghan, who also wrote the screenplay for Traffic and last made the oil industry drama Syriana which won George Clooney an Oscar, Gold never quite hits its stride. The film strives to replicate the feel of other films about people who cheated the system to get rich like American Hustle, The Wolf of Wall Street and The Big Short, but save for a few stylish editing choices, it lacks much of the energy that made those movies sing. The pacing feels off for much of the running time, with a lot of scenes built on exposition, but little in the way of character development besides the central figure. Matthew McConaughey does give the role his all, disappearing behind his noticeable weight gain, balding head and fake teeth, and moving through the scenes with a determined energy. But the film around him largely fails to live up to his considerable strengths as an actor. Bryce Dallas Howard in particular feels underused as Kenny’s long suffering girlfriend, and it’s pretty disheartening to see an actor of her calibre given so little to do. Although Matthew McConaughey gives an expectedly dedicated performance in the leading role, and the film picks up somewhat when the true story’s twists are revealed in the last act, for the most part Gold moves at too slow a pace to offer the exhilaration that this tale deserves. It’s an alright film that has its moments, but is far from the must see that the cast and story should have delivered.